Section headings and selected papers: Foreword. Fundamentals of Solidification. 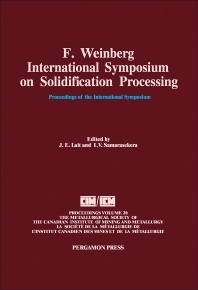 Recent research in solidification (invited paper), F Weinberg. The effects of crystalline anisotropy and buoyancy-driven convection on morphological stability, S R Coriell et al. Non-Ferrous Casting Processes. Direct chill ingot casting: progress in control (keynote paper), N B Bryson. Vacuum pouring, J L Dion et al. Continuous and Static Casting of Steel. Columnar and equiaxed dendrite growth in continuously cast products, A Etienne. Measurement of the mechanical interaction between strand and mould in the continuous casting of steel billets, I A Bakshi et al. Novel Solidification Studies.Solidification processing at near-rapid and rapid rates (keynote paper), M C Flemings. Influence of matrix solidification during infiltration on the structure of a cast fibre reinforced alloy, Ph Jarry et al. Static Casting of Cast Iron. Static casting of cast iron (keynote paper), I Minkoff. Metallographic study of the eutectic solidification of gray, vermicular and nodular cast irons, J A Sikora. A physical and mathematical model for prediction of microstructural features in cast iron parts, K K Banerjee et al. Semiconductor and Optoelectronic Crystal Growth. Toward complete models for bulk crystal growth of semi-conductor materials (keynote paper) (abstract), R A Brown. The control and properties of misfit dislocations in OMCVD growth epitaxial layers, G P Watson et al. Authors' index. Subject index. This international symposium is in honour of Professor\F\Weinberg who will be retiring from the University of British Columbia this year, following a distinguished career. Six sessions have been organized on Fundamentals of Solidification, Non-ferrous Casting Processes, Continuous and Static Casting of Cast Iron, Novel Solidification Studies and Semiconductor and Optoelectronic Crystal Growth, addressing the state-of-the art in each of these areas. Keynote speakers for the six sessions are: Dr\K\Jackson, Dr\N\Bryson, Prof\H\A\Frederiksson, Prof\I\Minkoff, Prof\M\C\Flemings and Prof\R\Brown. For researchers in the field.